I met friends Janeth Toral and Julia Bravo sitting outside a house on 14th Street just south of 30th Avenue, on a Saturday morning. Janeth works as a consultant for Mary Kay: they were selling beauty products made by Mary Kay and Avon from the porch to passersby. Janeth and Julia are both from Ecuador. Julia has lived in Astoria for 49 years and is now considered the “abuelita” – the “grandmother” – of her community. She works as a crossing guard by public school 171, which is bordered by 29th and 30th Aves, and 14th Street. Her work is clearly needed there, as there are no traffic lights. One day four years ago, after getting a group of children across the street, a taxi hit her and hurt her leg. She enjoys the affection she gets from the children and the fact their parents are grateful for her help. Julia’s own children are now grown up and married, and are currently serving in the army – she says that email helps her to keep in regular contact with them. Janeth came to New York from Ecuador 19 years ago. For the first year before moving to Astoria she lived in Corona. “I didn’t like it because it was so noisy. There was so much loud music! Here it’s a bit calmer. There are problems here and there, but we manage.” She began selling beauty products to help support her family. Her husband and two of her sons are in Ecuador, and her other four children (two boys and two girls) live with her in Astoria. Both Janeth and Julia agree that the good things about the neighborhood are the nearby parks – in particular Astoria Park with its swimming pool – and access to different things that they need: stores, schools, post-offices. The problems, they say, come mainly from people who come through from other parts of New York City. And as Julia adds, the prices are going up, making it an expensive neighborhood to live in now. The two women first got to know each other when Janeth’s son, now 13, was in pre-kinder. 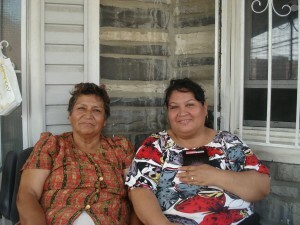 “He kept asking me about Julia, saying ‘when are we going to see my grandmother?’” says Janeth. “I would say no, she’s not actually your grandmother’ and he would say, ‘yes, she is!’”.